Our hard work in South Kingstown and Narragansett is not going unnoticed by the rest of the state. The Providence Phoenix's David Scharfenberg wrote on Thursday about the Tanzi campaign playing a critical role in shoring up progressive power in the State House. This election cycle is notable in Rhode Island for a number of reasons, and new opportunities will create movement that affect the membership of the Progressive Caucus in the General Assembly. It is vital that on September 14, we choose to elect men and women of courage who will fight for the health of our families and communities. We need champions of fair tax policy, clean government, the development of our local economies, and the protection of our natural resources. 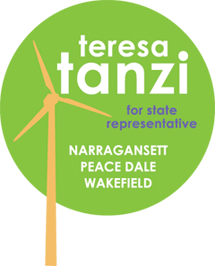 Teresa Tanzi will represent the interests of working families in Peace Dale, Wakefield and Narragansett, and will be a much needed vote for reform and accountability on the floor of the House. The potential loss of [Representatives Sullivan, Segal and Pacheco] makes a pair of Democratic primary insurgencies all the more important for the left. Teresa Tanzi is taking on Representative David Caprio, of Narragansett. And as expected, Maria Cimini announced this week that she will be challenging Representative Joanne M. Giannini, of Providence, who angered some on the left with her recent push to close the prostitution loophole. Tanzi and Cimini are, no doubt, emboldened by the state's fiscal crisis and broad anti-incumbent sentiment. But dethroning a long-time incumbent - Caprio has been in office for some 10 years and Giannini for 16 - is always difficult. No one would argue that this is an easy fight to take on, but it an important one that we all have a stake in. Please, make your difference today, through a contribution of dollars and hours to the campaign. You can always reach me with your ideas, enthusiasm and questions at libby@teresatanzi.com. Brian Hull of RI Future commented on Scharfenberg's piece, noting that the ""progressives' moment" is far from getting bleak." I couldn't agree more.